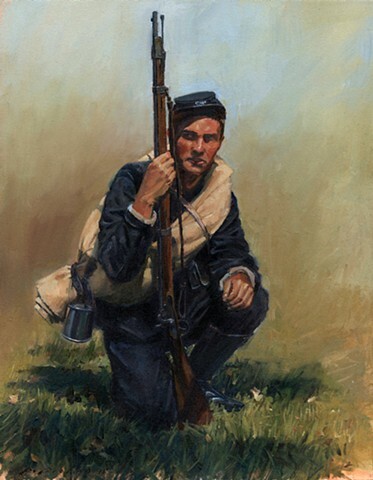 Study of a soldier from the 41st New York Volunteer (DeKalb) Regiment as they would have appeared in 1862 around the time of the Battle of Second Manassas. The men of the 41st NY, mostly of German origin, wore a succession of unusual uniforms. The unique elements in this uniform consisted of dark blue trousers, high boots worn in Prussian army style, imported Prussian ammunition pouches, and a regimental hat emblem.